I realized my generic sticker collection was missing the all-important “NATIVE” stickers, so I added some new designs to the Cafepress Store thingy. 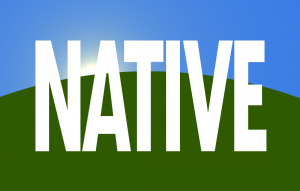 Are you NATIVE? I know I am. This entry was posted on Friday, November 17th, 2017 at 3:34 pm	and is filed under Misc. You can follow any responses to this entry through the RSS 2.0 feed. You can leave a response, or trackback from your own site.